Five BE12s of 21 Squadron Royal Flying Corps take off at 07:45 lead by Captain E F Norris (who will be accidentally killed in March 1918) flying an offensive patrol. They are engaged by eight enemy aircraft and Second Lieutenant Arthur James Fisher age 21 is shot down and killed just sixteen days after joining his squadron by the Red Baron becoming his 6th victim. 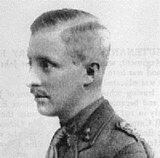 Captain Arthur Beadon Colthurst (Gloucestershire Regiment) is killed. His son will be killed in World War II. Captain Walter John Gerald Hoare DSO (Royal Fusiliers) is killed in action at age 28. He is the son of the late Reverend John Hoare Vicar of St John’s Kenswick. Chaplain the Reverend R H Belcher dies at home. Lance Corporal Maurice Wedd (Bedfordshire Regiment) is killed at age 20. His brother will be killed in April 1918. Lance Corporal William George Parsons (Bedfordshire Regiment) is killed at age 30. His brother will be killed in June 1917. Private Maurice Webb (Bedfordshire Regiment) is killed in action at age 20. His brother will die of wounds in April 1918. Private Owen Young (Bedfordshire Regiment) is killed at age 21. His brother will die on service in Egypt in two months. Private John Thomas Desborough (North Lancashire Regiment) is killed at age 20. His brother will be killed one day short of two years from today. Rifleman William George Wood (Rifle Brigade) is killed at age 19. His twin brother will be killed in December 1917.